Hello there! I wrote these lyrics for My Mai Tonight a while ago, but I feel as though my voice is not strong enough to carry the song on my own, so I thought doing a group cover of it would be the better option! All 9 members are available for audition. I will be self casting based on the auditions I get (but likely as Mari or Riko). I would love to also find some mixers, some artists, and some animators, but if I can't, that's fine! The final cover will be uploaded on my YouTube channel! I currently have auditions set to end at the end of January, and I would like to post the cover before the end of February! You can check out the lyrics here, and I will be recording a demo in the near future if you would like to hear that as well! Chika is sociable and rarely gives in easily. Her positive, can-do attitude gradually begins to affect everyone around her. She has a habit of explaining puns without being asked. 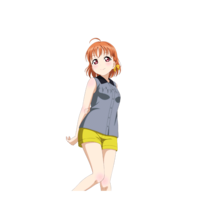 Sing at least a minute of any Love Live song in English as Chika! Please credit your lyricist! Your audition will not be considered if you do not credit! Feel free to comment if you can help with the mix, with art, or animate! She is reserved, modest, and likes indoor activities. She may look calm and mature, but she often flies into a panic, jumping to conclusions and making mistakes. She does not think she is special, so she does not want to become a school idol. However, her friend Takami Chika drags her into it. 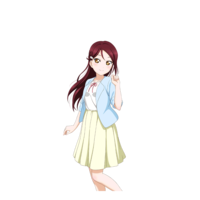 Sing at least a minute of any Love Live song in English as Riko! Please credit your lyricist! Your audition will not be considered if you do not credit! Breezily mature, she rarely sweats the details and usually maintains a calm, cool demeanor. She deeply cares for her friends and puts their needs above her own, going to great lengths to ensure they get what she thinks is best for them. 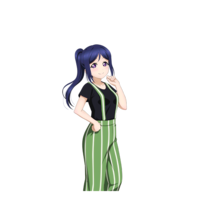 Kanan loves nature, claiming that she is happy every day just by being able to see the dazzling sun and blue skies. Sing at least a minute of any Love Live song in English as Kanan! Please credit your lyricist! Your audition will not be considered if you do not credit! Though always trying to remain calm and collected, she tends to become overly zealous when school idols are involved, as she is very passionate about the subject. She wants nothing less than total success for Aqours, and constantly pushes herself and her friends to be the best they can possibly be in order to achieve their goals. Despite being short-tempered and brash at times, Dia genuinely cares for each of her friends, particularly her younger sister Ruby, whom she is very protective and nurturing of. She has a habit of scratching her mole whenever she is telling a lie. Sing at least a minute of any Love Live song in English as Dia! Please credit your lyricist! Your audition will not be considered if you do not credit! You is an energetic, positive girl with attitude for outlooks; focusing on her goals. She tends to take action without thinking things over first, and usually says "Yousoro!" as her catchphrase. Sing at least a minute of any Love Live song in English as You! Please credit your lyricist! Your audition will not be considered if you do not credit! Yoshiko seems to be a bit of a Chuunibyou, a person who holds delusions of grandeur. She's bright, self-assured, smart, and thoughtful. 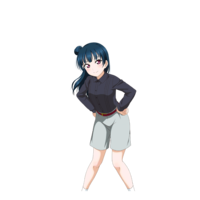 She hates to be called "Yoshiko" and refers to herself as "Yohane" instead, going as far as to cross out her real name in her introduction and replace it as such. She describes herself as a fallen angel who has angered God, because she is cursed by extreme bad luck. She runs into all kinds of unforeseen trouble wherever she goes, such as when she goes on trips it's bound to rain, whenever it snows she's bound to fall, she has never won anything from lucky draws in convenience stores, and she always falls sick with influenza right before her final exams. Sing at least a minute of any Love Live song in English as Yoshiko! Please credit your lyricist! Your audition will not be considered if you do not credit! 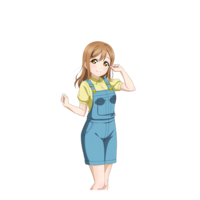 Hanamaru, known as "Maru" for short, is a hardworking girl who diligently works at her family's temple. She spends a lot of time reading alone and is easily distracted. Because of how she was raised as a temple girl, she does not watch the television much nor does she use the internet, making her outdated. She is often teased due to this but is usually defended by her best friend Ruby, but she ended up crying at first, causing Hanamaru to comfort her instead. She seems to be quite self-depreciating, calling herself a "chibi procrastinator" and "neither cute nor interesting". She is gentle and caring for those around her but often finds herself going in circles anyway. She aspires to be like Ruby, whom she sees as "beautiful, cute and dazzling". Due to how she sees herself, Hanamaru didn't think she was fit to become a school idol. However, after learning about Hoshizora Rin and how she once felt the same, she was inspired, then decides to be a school idol by supporting Ruby in her endeavor. 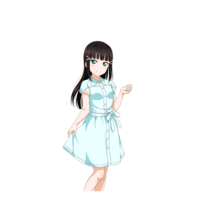 She has a distinctive verbal tic and dialect, tending to end her sentences with "zura", as well as using "ora" as a first-person pronoun referring to herself. Sing at least a minute of any Love Live song in English as Hanamaru! Please credit your lyricist! Your audition will not be considered if you do not credit! Mari has a cheerful personality and often prefers to work by herself. She always keeps her chin up when faced with hardship as not to burden others, and is ready to try her hand at anything, however she does not feel she is very suited to become an idol. 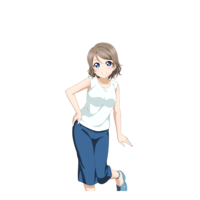 Mari speaks with an accent, and she has a high, cheerful voice. 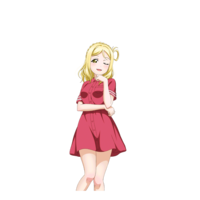 Mari often inserts English words into her sentences, but when she is sad or serious, the pitch of her voice becomes lower, she loses her accent, and she uses English words less. 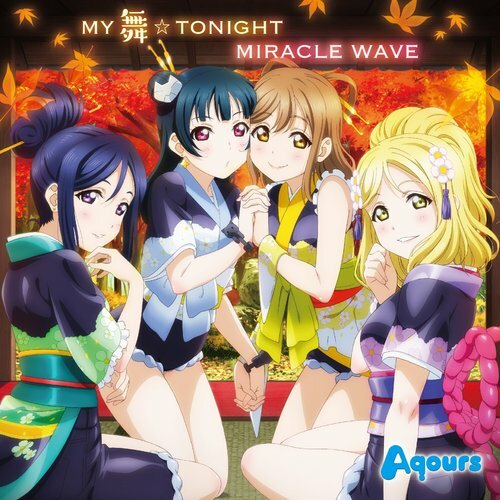 Sing at least a minute of any Love Live song in English as Mari! Please credit your lyricist! Your audition will not be considered if you do not credit! Ruby has never talked to any males besides her father before, so she has always been bad at dealing with the male gender. She is fearful, shy, and easily upset, but still has a tough interior, forged by her role as a girl in a rich, well-known family. She often says "Ganbaruby! ", her catchphrase, to encourage herself or others to do their very best. She also refers to herself in the third person from time to time, just like her best friend Hanamaru. 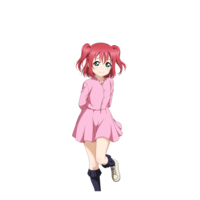 Sing at least a minute of any Love Live song in English as Ruby! Please credit your lyricist! Your audition will not be considered if you do not credit!